We meet in a quiet corner of Kabul, a neighbourhood that’s largely untouched by the security issues. I know the city moderately well. But this does little to ease my apprehension. If I’ve misjudged this, the consequences could be severe. It’s winter and the whole city is covered in a blanket of snow, meaning that movement is much slower, but the city does appear quiet than when I was last here. There is a group of 8-9 men stood around chatting and laughing. The sun is out and it’s a moderate 10 degrees. Everyone is dressed slightly differently: Some are dressed appropriately for the day - wearing outdoor jackets, walking boots and cargo trousers whilst some are wearing jeans, leather jackets and leather fashion boots. Soon after, another 4-5 young men join us, and I notice the familiar sight of a snowboard bag as it’s lugged out of a car. The walk to the start of the climb - very icy but the group was in high spirits! There is a tentative sense of security on the streets of Kabul as the Taliban engage with US diplomats in peace talks in Doha, Qatar. The conflict here has cost billions of dollars for many countries and claimed the lives of many on all sides – but there is still adventure to be had in this, the most unlikeliest of places. After topping up our flasks with hot green tea from a friendly street vendor, we set off towards the mountain. Research tells me it’s around 3000m high and judging by the profile of the slopes; would need safety gear to mitigate the avalanche risk of the last section. For now, we’re going to hike up through the snow to a bivvy spot around 2500m. We’re led by Shoaib, a charismatic thirty-year old Hazara man that trains in these hills almost every week. He knows the route like the back of his hand and makes the perfect guide for showing us the way. Shoaib speaks a little English however it’s miles better than my Dari / Farsi and we get by just fine. We only met a few days prior in a café after talking online for a couple of months. Being regularly in touch with the sports community in Afghanistan means that I’ve got to anyone remotely involved in sports here. He’s ably supported by Mustafa, a twenty-something mountaineer who is passionate about the outdoors – although he doesn’t have the same level of protective clothing that Shoaib does. The group is excitable as soon as we step off on the route. At 35, I’m well above the average age – but their energy is intoxicating, and I feel myself wanting to goof around with the younger members, who are throwing snowballs at each other. I have to pinch myself that this is actually happening: me – a former British military officer; climbing mountains with these young men who have lived through the fall of the Taliban and subsequent guerrilla conflict that followed. But I realise adventure is universal, whatever language you speak. Mustafa out front (red jacket) leading the way in the Kabul foothills. 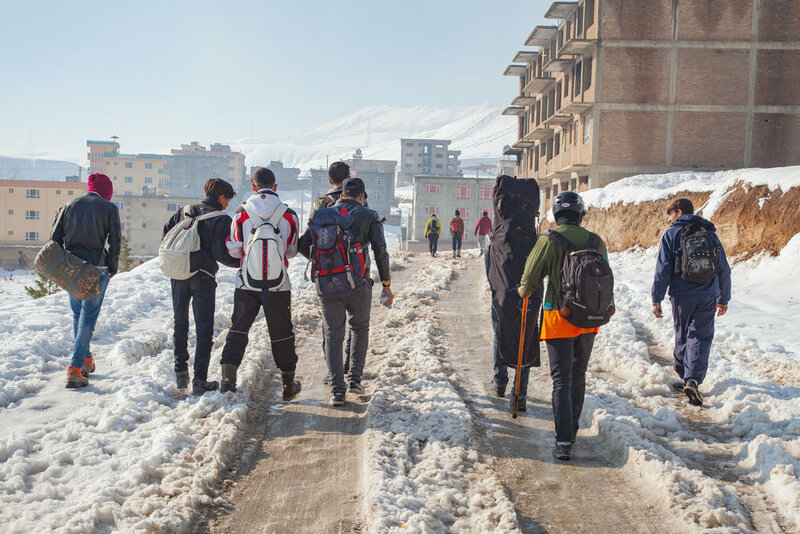 Another addition to the group is my good friend Asghar – a young man in his early twenties and the leader of the freestyle mountain team ‘Drop and Ride’. He’s using a crutch to walk after a botched 360-degree spin on a jump went awry leading to a hyper-extended ankle. An X-ray at a nearby clinic revealed that it wasn’t broken but it would need rest. Naturally, as soon as I said I’d arranged to go climbing – he found a crutch and decided he was joining! Between taking selfies, he’s translating for the group and I – adding another level of richness that brings the climb to life for me. At just 21-years old, he has wisdom beyond his young age. I try hard not to but just can’t fathom achieving the things that he has – in Afghanistan – at his age. The snow makes the walk challenging. It’s frozen on top so holds my weight for split-second before you sink past your knees. I step in their footprints – the compressed snow fails to hold my weight and I sink down another foot, sending me off balance. At 100kg I’m easily the heaviest member of the team and at least 20kg heavier than the nearest member. But despite this, they are reluctant to let me go first so that they can compress the snow for me. The only snowboard between 10 people, carried here by the younger members. As we traipse up the mountain through frozen snow, we talk about all kinds of subjects in life - from adventure, life, family and challenge - the parallels as to what draws us into the mountains is exactly the same wherever you are in the world: to have fun and explore what we’re capable of at the time. It takes us around 4 hours to cover 10km to a beautiful rock face that we use as a bivvy site to protect us from the sun and take in the incredible vistas of Kabul - arriving around lunchtime. Everyone has soaking wet boots and frozen feet, but the enthusiasm is unabated. As the team take turns to pray, the others start pulling out a tent, gas stove, a tray of eggs and set about cooking lunch. Asghar and I have bought fruit to eat however the team tell us that we are their guests and we should eat with them first. It’s an incredible moment that takes me a while to comprehend: 2 cultures overcoming the language barrier through adventure in nature. But it’s not all fun. When we get to the bivvy spot, I notice a huge grey cloud hanging ominously over the city. At first, I naively assume it’s a rain cloud but then am quickly informed its pollution. It’s sitting right between the buildings (which we can see underneath it) and the blue sky and mountains above meaning that the city would be a dull grey colour. The guys tell me that it’s the effects of the cars and people burning whatever fuel they can find to stay warm in the winter months. For the affluent, this is wood, but for the not so well-off; it’s car tyres; sawdust; plastic rubbish or coal. 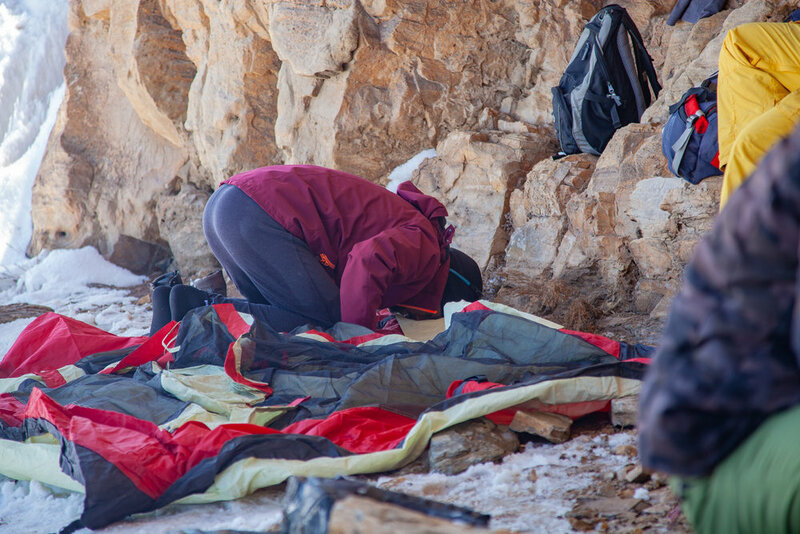 After we’ve all taken turns to eat in tent, we turn around a head back. Goofing around and playing in the snow all the way back to the city, the youngsters of the group are having a great time. As I walk back down the frozen snow, I can’t help but think about the pollution that these kids are breathing in every day. The visceral sight of seeing the pollution hanging over the city is seared into my mind now as I think about day climbing above the sky.